Looking to get a physical replacement or digital copy of your training cert or wallet card? You have two options, just pick one, and contact us or fill out the form located on this page and we will contact you. If you just want a copy of your certificate/wallet card by email, we are happy to provide this service within 24 hours for no charge. If you would like a new certificate/wallet card to be mailed to your address, you must prepay (by debit/credit card) a $30 fee PER item and we would be happy to reproduce these items and send you a receipt by mail with the replacement(s). We want to back up our training courses and will always provide a digital copy of our records for free. This is part of our service, however the man hours and costs for actual certificates, ID cards, and mailing materials continue to rise to the point that we just can't continue our previous practice with no fee to help cover the costs. Need to get back to our homepage? 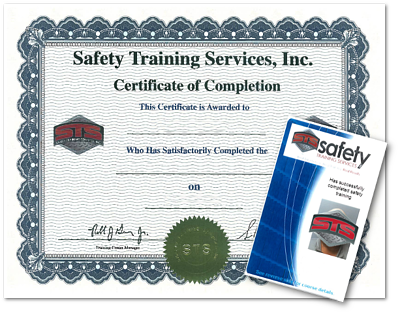 © 2019 Safety Training Services, Inc.